Summer, camping and Dutch oven cooking go hand in hand. 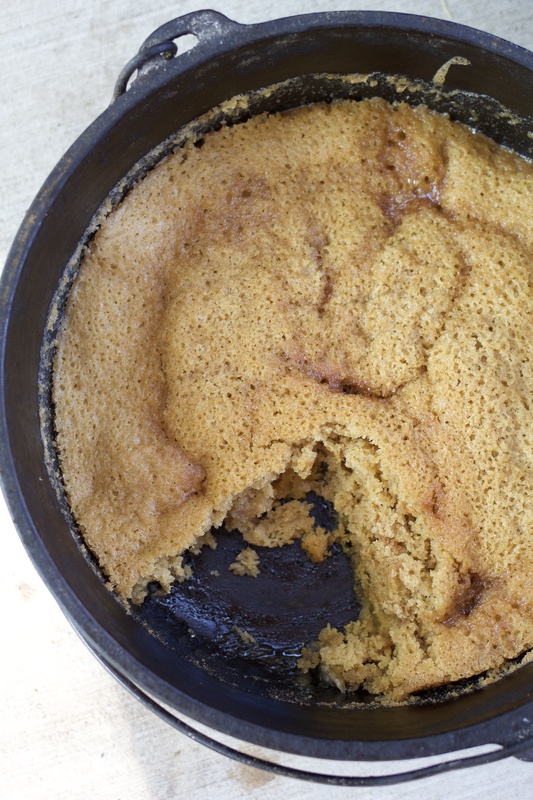 This Dutch Oven Upside Down Peach Cake will satisfy everyone’s sweet tooth on your next campout! There is something about cooking in a Dutch oven that says “pioneer”. For us, cooking Dutch oven-style usually happens in the summer when we are at our cabin or at an outdoor activity. One thing is certain, food always tastes better when it’s cooked in a Dutch oven! Years ago, we purchased a few Dutch ovens and decided to try our hand at Dutch oven cooking. We have three Dutch ovens (with legs) of various sizes: 12 inch regular (6 quart), 12 inch deep (8 quart) , 16 inch regular (10 quart). I highly recommend the Lodge Brand. Lodge makes a quality product. I’m sure our Dutch Ovens will have a longer life than either Grant or me! Lodge also make Dutch ovens that look similar to the “camp” style Dutch oven, without the legs. The pans without legs are easily used in your oven. If you want to use your traditional Dutch oven pan (with legs) in your oven, simply lower the rack in your oven to one of the lowest levels and place a sturdy jelly roll pan or cookie sheet in the oven and place the Dutch oven on top of the cookie sheet to cook, this will stabilize the legs of the Dutch oven. We aren’t huge gadget people, so we don’t have every accessory for Dutch oven cooking, but we have found this lid lifter to be very helpful. For years we used large pliers, but this tool is really handy and helpful! Also, a heavy duty pair of oven mitts are highly recommended! One last thing- Every time I post a photo of Dutch oven cooking, I’m asked about the pan we set under the Dutch oven. It’s an old cheap aluminum pan we bought for about $4 maybe 25 years ago. It was meant to be a disposable bbq pan, the type that had the grate on top, you know, the kind our parents took camping or to the beach? That’s the one. No idea where to purchase them now! I have a couple of Dutch oven desserts on ABK which I posted a few years ago, Black Cherry Chocolate Dutch Oven Cobbler and Red Raspberry Dutch Oven Cobbler ; both are delicious desserts. The recipes are cooked in the Dutch oven, both are quick and easy desserts made with cake mixes and always a hit with adults and kids. 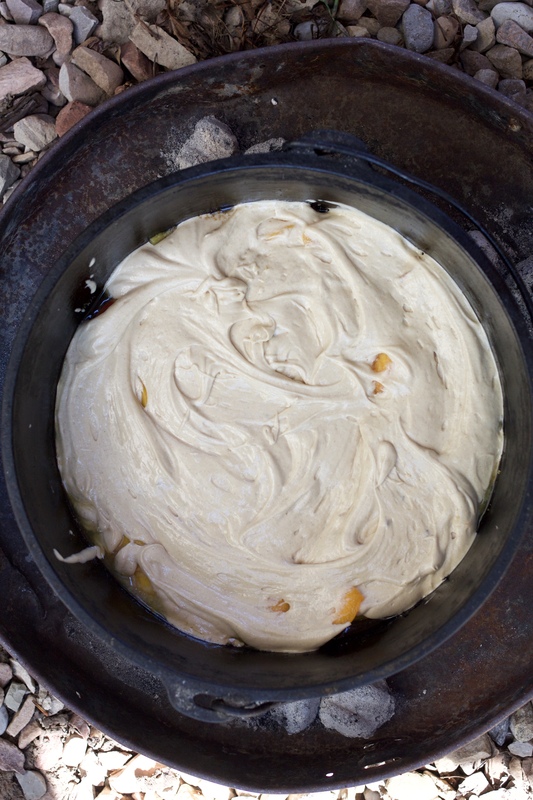 Using a cake mix for dessert while camping makes dessert super simple and the perfect ending to a camp out meal. If you are serving a large crowd, the cake mix route is absolutely the easiest way to make a warm and satisfying dessert for the masses! Many recipes for Dutch Oven desserts use a cake mix, combined a few other ingredients, such as the dishes above. I’ve made lots of desserts over the years in the Dutch ovens, everything from Fresh Cranberry Apple Pie to cobbler to brownies. This time around, I wanted to post a recipe that was homemade without the use of a mix. 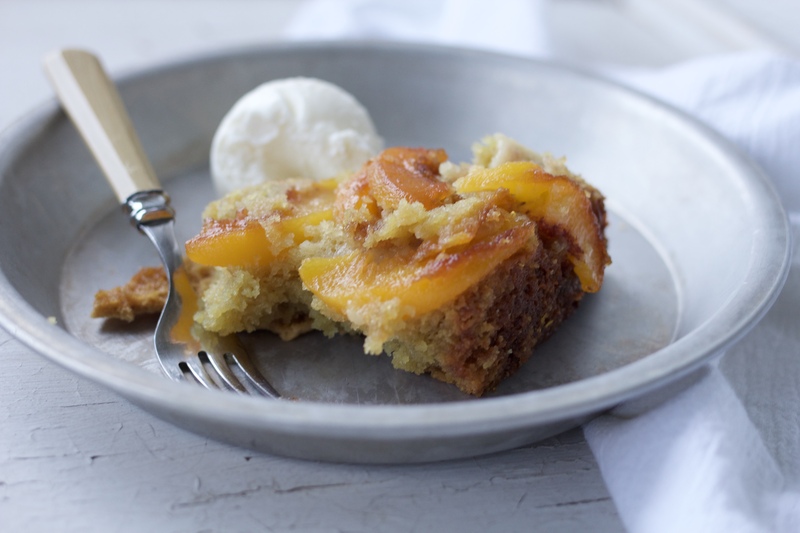 Dutch Oven Upside Down Peach Cake is almost as easy as using a mix. 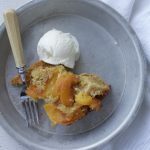 Basic pantry friendly ingredients, mixed together with either fresh, frozen or canned peaches make this dessert one you’ll love. Make sure you have ice cream or whipped cream to top it off! Prepare a 12 inch Dutch Oven for cooking, wipe out, spray inside lightly with cooking oil. Heat up about 25 coals for cooking (the recipe calls for 19, but I always heat up extras). This will take approximately 30 minutes. While the coals are heating up, prepare the cake. The coals will be white when ready. Cream butter, oil and sugars together in a bowl. Beat until smooth. Add eggs and beat until smooth and fluffy about 1 minute. Add flour, soda, powder, salt and cinnamon. Pulse until the flour disappears and is mixed well with the butter mixture. Leaving the mixer on low, add the buttermilk a little at a time until all of the buttermilk is added to the mixture in the bowl. Mix for one additional minute or until all ingredients are incorporated. Create base layer by melting butter in the bottom of the Dutch Oven. 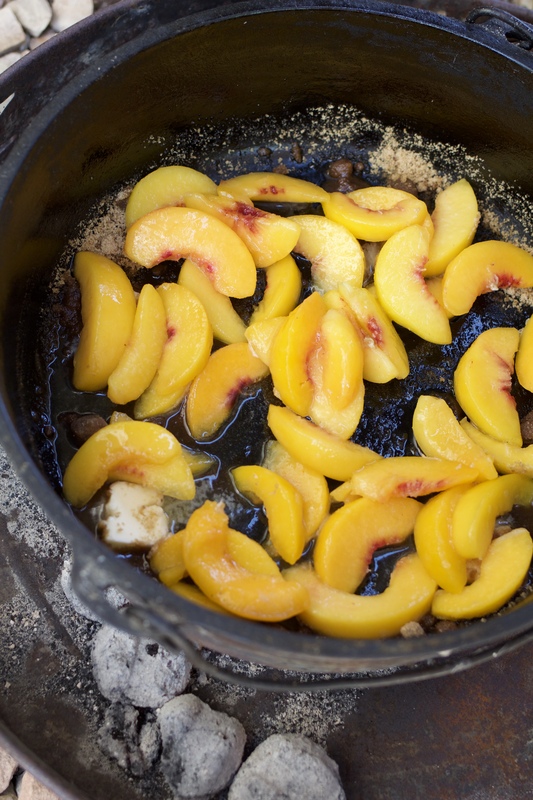 Add the brown sugar and peaches and spread the peaches out into a single layer in the bottom of the Dutch oven. Pour the cake mix over the peaches, place the lid on top of the Dutch Oven. Place 12 hot coals on top of the Dutch Oven and 7 under the Dutch Oven. Set a timer for 12 minutes. The cake will take 10-15 minutes to cook. When the cake has baked for 12 minutes, remove so the Dutch Oven is not over the coals. 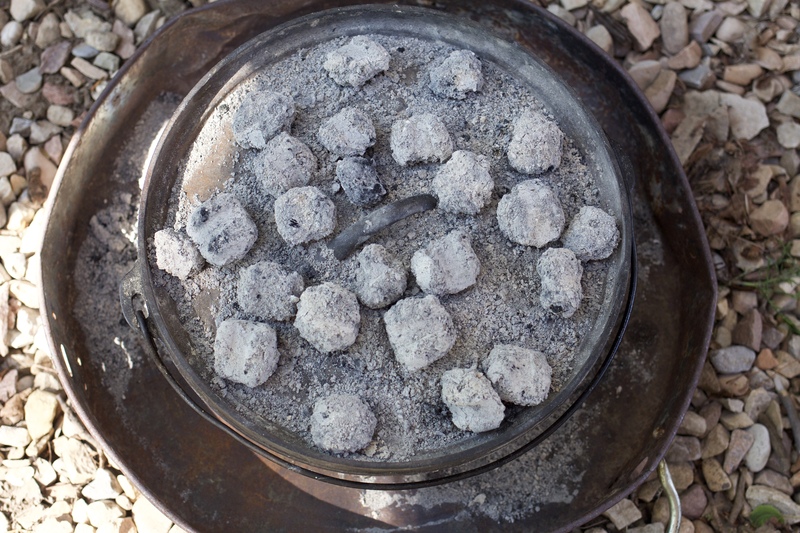 Continue baking with coals on top for a few more minutes, usually 3-4. Insert a toothpick in center to test cake. When toothpick inserted in center of cake comes out clean it is done. No Dutch oven here. Can i do this in my oven? If so, what size dish would I use? 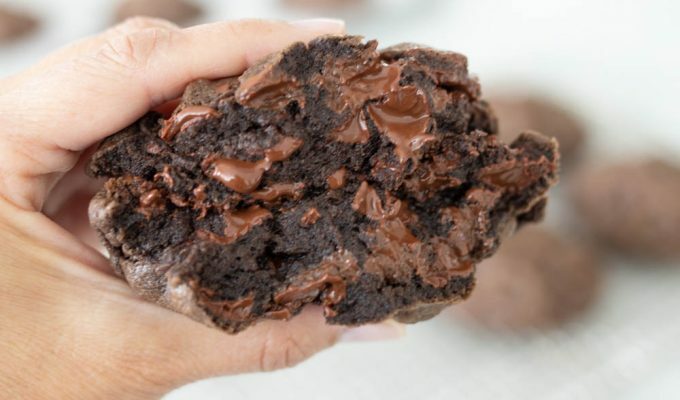 I tried this in my oven in a 9×13 and it overflowed. The second time, I used a Le Creuset 6 quart Dutch oven, meant for baking or cooking stove top. I did not cover the pan with the lid, which I probably should have. You could also split this into a 9×13 and a 9×9 pan and Im fairly certain you would not have issues with the cake overflowing. Could you make the batter at home the day before ahead of time and just store in a plastic bag in a cooler so when camping you don’t need to do any mixing? I would mix the dry ingredients at home and place in a ziplock bag, and then the wet in ingredients together in another bag. At Camp, mix in a bowl with a whisk. Sometimes, if you mix batter together and don’t bake for a while the rising agent (baking soda or powder) will activate and then not work properly if left to sit too long before baking! Great question. Thanks for reading ABK! Can you use a ceramic dutch oven pan and cook this in a regular oven? Yes I have made this in a Le Creuset Dutch Oven, baking in my oven! Could I make this in the oven too? Yes, just use a 9×13 plus a 0x9 pan so it won’t overflow! or use a dutch oven with a lid. The conversion for 25 coals in a 12″ Dutch oven is equal to 350 degrees in a oven. Thanks for that information. 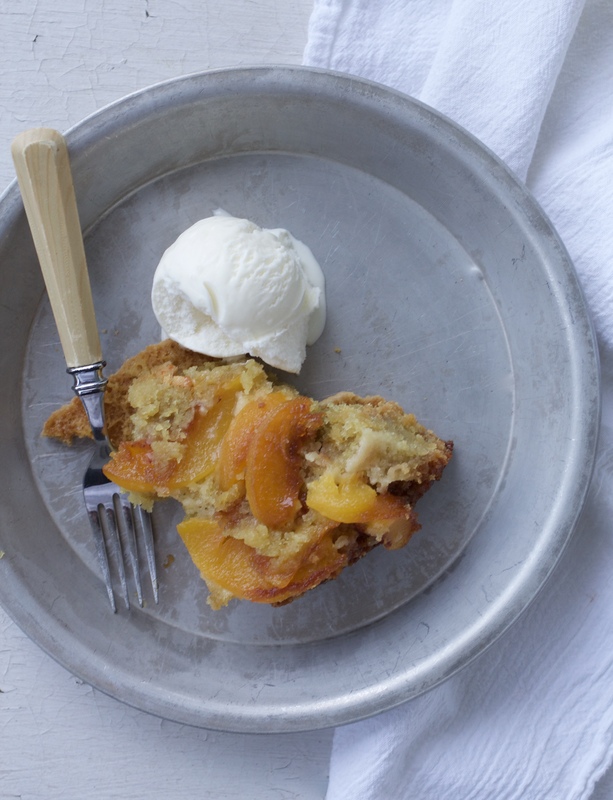 I hope you enjoy this delicious peach cake whether cooked in the oven or with charcoal. Great recipe, however I found the bake time way off using a 12″ dutch oven with coals. Had to adjust the coal count to 25, and bake for more like 45 min. Thanks for sharing, Ken. Huh, that’s interesting. I’m glad you found a way to make it work though, the time may vary based on your dutch oven.